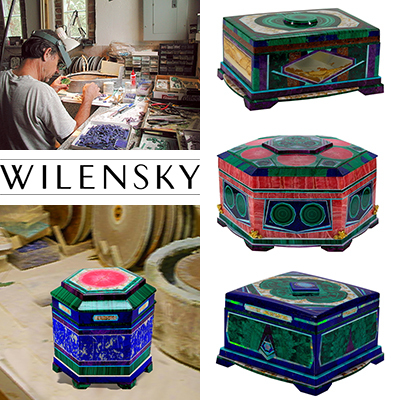 We are delighted to invite you to an incredible evening at the Wilensky Gallery, exclusively for the gem and jewelry trade. After a day at the shows, join us in Chelsea for complimentary drinks and appetizers, networking, and a behind-the-scenes tour of collections and exhibits with internationally renowned fine mineral dealer and collector, Stuart Wilensky. 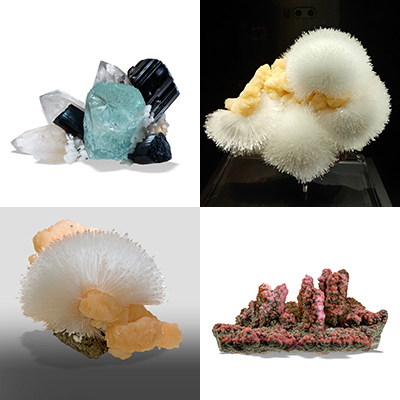 Rare mineral specimens will be on display, alongside an existential mineral photography exhibit by Evan D’Arpino, Abiogenesis. Highlights include grandidierite gemstones, liddicoatite, a rhodochrosite & chalcopyrite stalactite specimen, artfully formed scolecites and aquamarines, an exceptional collection of miniatures, and intarsia boxes by acclaimed artist, Nicolai Medvedev. Admission is free for members and friends of WJA, Gen-Next Jewelers, AGS Titleholders, and IDCA, but RSVP through WJA’s website or Facebook page is required. Second photo: top left: Aquamarine with Schorl & Quartz, right: Scolecite & Stilbite; bottom left: Scolecite on-Stilbite, right: Rhodochrosite and Chalcopyrite. Third photo: clockwise: Nicolai Medvedev in his studio; Big Apple - Intarsia box by Nicolai Medvedev. Materials include: malachite stalactite, gold in quartz, sugilite, dinosaur bone, azurite/malachite, turquoise, copper ore, picture jasper, 18k gold, exotic woods interior. Creation date: 2003; Big Garden - Large hexagonal intarsia box by Nicolai Medvedev. Materials include: azurite/malachite stalactites, rhodochrosite stalactites, malachite stalactites, malachite, rhodochrosite, sugilite, turquoise, Australian opal, 18k gold. Creation date: 1992; Intarsia Box - Created by Nicolai Medvedev Lapis, gold and quartz, malachite, Australian opal, dinosaur bone, sugilite, turquoise. Features a malachite stalactite on the top of the lid, opalized palm on the inside of the lid, and rare hardwoods inside the box. 18k yellow gold hinge. Creation date: 2003. Rose Garden - Intarsia box with hexagonal shape by Nicolai Medvedev. Materials include: Rhodochrosite stalactite, Australian opal, gold in quartz, malachite, sugilite, turquoise & Russian lapis lazuli with calcite veins.